Microsoft finally announced its upcoming version of Windows earlier on this week, and to the surprise of just about everybody, the software maker has opted to call it Windows 10. A bit strange, particularly given that the last major version was Windows 8, but nevertheless, it’s the features that count. On first impressions, the updated edition of the software giant’s flagship operating system has plenty of those, and with the Technical Preview having been subsequently rolled out, desktop users are beginning to adjust to the tweaked environment. If you want to install / run as a virtual machine, it’s not that difficult to get up and running, and below, we’ve a step-by-step tutorial guiding you through the necessary steps to achieving this goal via Parallels Desktop. Please note, that it’s still very early doors, and as such, Parallels "does not guarantee yet any compatibility with this Operating System at this stage of development." Thus, expect imperfections both on the part of the Parallel’s software and on the count of Windows 10 being a mere Technical Preview. Presuming that you already have Parallels Desktop 10 installed on your Mac (if not, download the free trial from here). Step 3: Within the Parallels folder, you’ll now have the Windows 10 shell.pvm file. Double-click it, and then click on Copied. Step 4: On the next pop-up window, select Don’t Change. 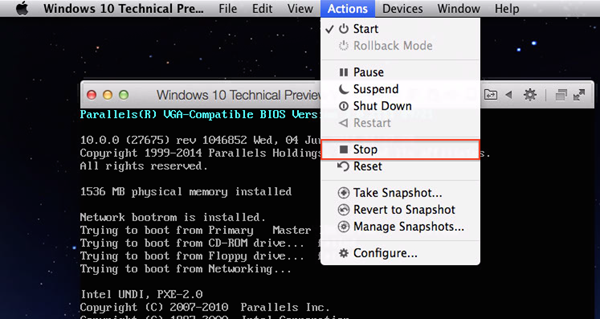 Step 5: In the Preboot eXecution Environment (PXE) screen, select Actions from the top, and in the drop-down, Stop. Step 6: Then, hit Actions again, followed by Configure > Hardware > CD/DVD 1 page > Connect to: > Choose an image file. When browsing, locate the WindowsTechnicalPreview.iso you downloaded in Step 1. 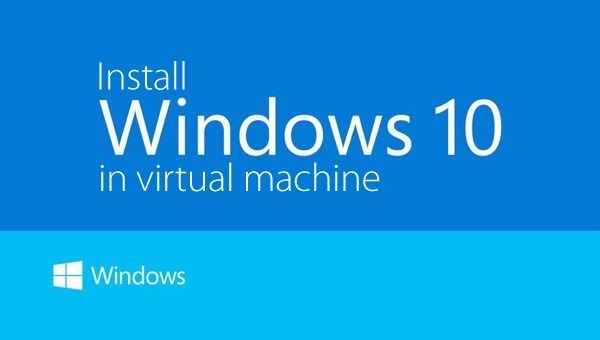 Step 7: Next, fire up Windows 10 Technical Preview VM shell virtual machine and proceed with your Windows installation. Step 8: Once the process is complete, create your user account for Windows 10 Technical Preview Desktop. Step 9: Finally, install Parallels Tools by going to Actions > Install Parallels Tools. And that’s it! Just because you own a Mac, doesn’t mean to say that you can’t test drive Windows 10 TP, and if you do set up a virtual machine on your Apple computer, do be sure to let us know how you get on in the comments. Seems like a downgrade to me…we’re back from an interface that seemed like a fusion of PC + Tablet, to the original Start Menu of Windows. I agree, a lot of people said they liked the start menu better but personally, I liked the W8 interface much more. Or do as me…… Since I’m not willing to pay 50 beans to upgrade parallels in order to use it when Yosemite releases I gave Oracle’s Virtual box a try and it works damn good oh, and it’s free open source software. Thanks for share, this tut working for me. im using Parallels 10.1.0 (28600) n installed windows 10 through bootcamp. On step 6, instead of choose cd/dvd, u need to choose HDD 1, edit partition is ur bootcamp. every thing working ok.
where can i get parallels 9? If you don’t have any versions of Parallels then get version 10. I was using version 9 until I upgraded to OS X 10.10. By the way it’s faster after doing a complete reinstall of everything, OS X and only the apps that I require, cleaned out almost 5 years of crap. This has been endlessly frustrating. I try to download for OS 8.1.2 and it gives me “TaiGJBreak_EN_1201.exe” and says this file type is not supported. What do I do? well if you’re trying to open it from mac, then of course it’s not gonna support that file type. “.exe” is a executabole file only for Windows. Use Windows 10 on the VM to open it.